Peter Du Plessis is 20 years old. He is employed at Spar in Montagu, and one of his responsibilities is to round up the trolleys that shoppers leave in the car park, in the road, or sometimes even half-way down Long Street. Tidying up where necessary is part of the deal. Imagine his surprise in early July when he removed a brown paper packet that had been left behind in one trolley in the car park and found that it contained more than R20,000 in cash, more money than he is likely to be able to save in five years. Tempted or not, and nobody knows, Peter took the bundle to the Spar Security Manager immediately. And so it was in due course returned to its very relieved owner. 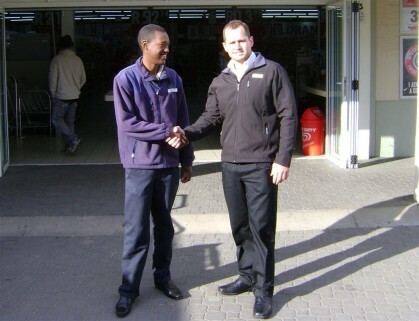 In the photograph: Zander Smit (right), of Spar Management, is seen congratulating Peter for his outstanding and spontaneous act of honesty.